The hospital, commissioned in 1960, provides medical care to the patients across the oil sector. The officials are constantly keen to provide the best medical services. Thus, the hospital also plays a major role in delivering instructive medical lectures and issues booklets and brochures to promote awareness about health related matters. Ahmadi Hospital offers a broad portfolio of medical treatment and related services, including Accident & Emergency; General Practice; Internal Medicine; General Surgery; Orthopaedics; Dermatology; Obstetrics & Gynaecology; Paediatrics; Ophthalmology; Ear, Nose & Throat; Dentistry; Preventative Medical Services; Radiology; Anaesthesia; Intensive Care Laboratory; Physiotherapy; and Dietary Services. 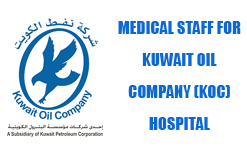 The Company is currently building a new hospital to the tune of about 86 million Kuwaiti dinars. The New Ahmadi Hospital has an innovative and functional design that is sensitive to regional and Islamic principles and traditions, as well as reflecting local environmental conditions. It incorporates state-of-the-art technology, as well as up-to the- minute energy and water conservation systems, and has been created with future growth and expansion in mind. Report / Courier 2 sets of complete CV, photos for final Interview. Kumar Travels, Opp. YMCA, Shenoy’s Jn., Ernakulam.